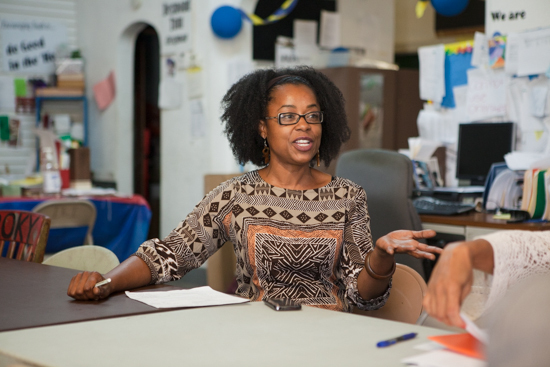 As a summer organizer for President Barack Obama’s 2012 re-election campaign, Sonya Harper, a longtime Englewood resident, began to connect the fragile quality of life in the neighborhood and low voter turnout. Voter turnout in the two wards, among six wards that compose Englewood, is among the lowest in Chicago. After her organizing job ended, Harper, 33, launched Englewood Votes, a non-partisan volunteer effort to help increase voter participation and civic engagement in the community. Now, she is assembling a team to help boost turnout in the November gubernatorial election—in between juggling her various roles and titles. Harper is an outreach manager for Growing Home, a volunteer at Imagine Englewood if, an organizer with RAGE (Residents Associaton of Greater Englewood) and the facilitator for the Grow Greater Englewood Coalition. The Chicago Reporter sat down with her to discuss the progress of the voting campaign. How did the Englewood Votes campaign come together? Englewood Votes came along after I became involved in the community. I left my career in television news because I wanted to effect change. A friend of mine was running an aldermanic campaign for the 15th Ward. I decided to help him. I ended up liking [the campaign process] more than he did. He didn’t win. So once the campaign was over he went back to do what he was doing but I continued to stay involved. Then in 2012, during the [presidential] election, I sent out an email to community organizations and leaders to bring a coalition together to raise awareness of low voter turnout—because, really, what other time can we get people in this community excited about voting, if not right now when there is a black president in office. Why did you think the area needed a coalition like this? We noticed that in other communities where voter turnout was high, things were better. For instance, they have more resources like grocery stores, and there aren’t many food deserts there. An elected official is always going to look out for their constituents; they’re going to look out for the residents that are voting. Is it difficult to get residents to vote in Englewood and surrounding areas? Why? It is very difficult. Just the motivation to get them there. A mind shift has to take place in order for people to feel like their vote is important. The biggest misconception is that [returning prisoners] can’t vote. That’s the biggest lie that we set out to debunk. A lot of our voters tend to be returning citizens. When we get them to register, I consider that a success. What do you hope to achieve in the November election? We want to get the candidates to Englewood for a candidates’ forum. I feel like that would help energize the voters. What is your strategy for increasing voter participation? In the past, our target was to increase the turnout of young people and returning citizens. That was our focus, and that will still be part of our focus going forward. Now, we want to target those that turned out for the 2008 and 2012 elections. We know they’ll go vote. But we want to make sure they continue to go out and vote–not just in the major election but in every election. What results have you achieved since your campaign started? I would estimate that we’ve registered 400 voters [in the presidential campaign]. We held our voter registration drive in the six different wards in Englewood. It was our goal to partner with every major organization to increase voter registration. At the end of the day what keeps you going? At the end of the day, it’s about another kid not getting killed. I feel very traumatized by that. Too many people close to me have died. It’s time for the community to stand up in a way it hasn’t in the past 30 years.